[MYSTERIOUS WAYS' protagonist] Karl's resolution disturbed me. I wanted to talk sense into him. And it was when that desire hit me that I realized I had been deeply lured into the author's illusion. Davis had seduced me, had nauseated me with Karl's condition, had required of me a series of judgments on issues I usually ignore. I kept thinking, this is only a book, this is only a book, and of course, it is. But it rises to the highest sphere of literature -- it makes the reader consider the totality of his existence and examine all the evidence." "I met Terry Davis today. He was here to speak about ... 'MYSTERIOUS WAYS'. 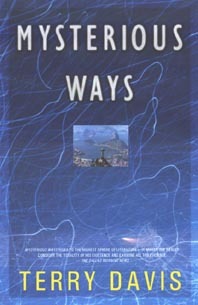 I've read 'MYSTERIOUS WAYS', I don't know if I ever made any references to it before off hand, but I enjoyed it a lot. Just like he said tonight, it is a book to be read by one person at a time. Just you and the book. A lot of it hits home so hard it's frightening. He's really a nice guy I think I'd like to have him as a teacher." "Thank you so much for letting me know - let alone for reuniting me with a name from my past. 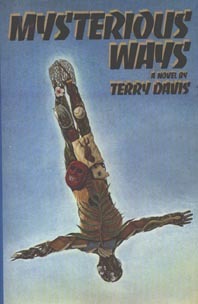 I'm sure he doesn't remember - but a long time ago, Terry came to Topeka West High School and spoke to a book club...I thought he was a wonderful speaker and writer. I'm thrilled to know you have linked to my site.